Size: 40" Length.Wooden dowel 8" and 10" Length. Ideal for planters up to 9" in diameter. 2 set uniquely handmade fits a variety of flower pot in diverse shapes and sizes.It is made of high quality cotton, strong and durable. Not easy to deformation, corrosion resistance. Fits for indoor and outdoor use and also can match with flowerpot to decorate hotel or parties. Safe and convenient. Suitable for various occasions. YXMYH meticulously hand-crafted for your living space.Beautiful decoration to show your lovely plants.We have always been absorbed in designing pretty Plant Hanger. We believe that our products aren't just pretty.That help add a little special, beauty and vitality to your life. 【HOME DECOR】This macrame plant hanger excellent quality, adds the perfect touch to your room and living room.ideal for display your beautiful plant, vases, books, or decorations. Creates lovely, modern shaped boho home decor. 【SAVE SPACES】This macrame hanging plants planter makes a wonderful gift for housewarmings, weddings, and all occasions.You save on shelf space and can beautify any indoor / outdoor corner spaces. 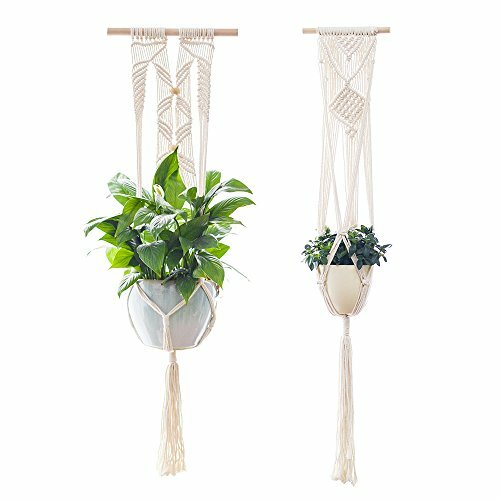 【STYLE】 Versatile style macrame plant hanger that can hanging in the ceiling, suitable for decorate your home and garden.Simple and modern style, make your life become unique. 【MATERIAL】Made of cotton cord, wood dowel.strong and durable cotton plant hanger.No plant or flower pot included in this item! 【SIZE】This macrame hanging shelf is approximately 41" in height including the tassel.In the picture 1, the first flower pot shown is 7.5" in diameter, 6.3" in height.The second flower pot shown is 4.7" in diameter, 3.9" in height. If you have any questions about this product by YXMYH, contact us by completing and submitting the form below. If you are looking for a specif part number, please include it with your message.